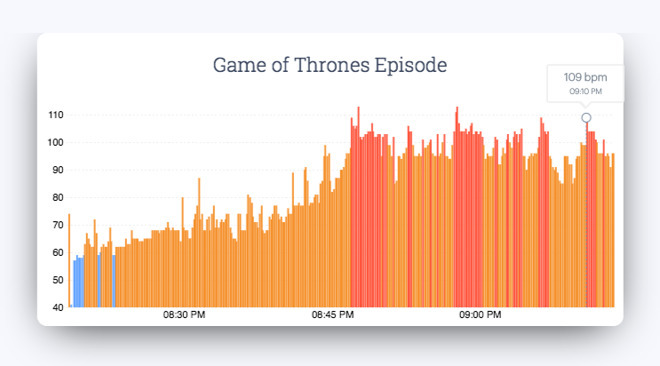 Fans of the HBO fantasy series Game of Thrones are more excited by dialogue than by action scenes, according to a study by heart monitoring app Cardiogram of Apple Watch users. Four out of the top five scenes to cause high pulse rates in viewers centered around drama between characters, rather than violence, the Cardiogram app found. Three-hundred people were enrolled into the app's Cardiogram Habits feature, entitled "What Game of Thrones does to your Heart Rate." It reminded users to turn on continuous heart rate recording on their Apple Watch at 8:45pm on Sundays. Approximately 2.3 million measurements were taken across the first four episodes of the current seventh season, with the high frequency of measurements allowing the startup to spot trends based on what was happening onscreen. The event with the highest average pulse rate so far was Jamie Lannister's charge against Daenerys Targaryen and Drogon, an action scene that focused on conflict between two main characters, preceded by another scene concerning Tyrion Lannister's internal conflict. The scene achieved an average heart rate of 91 beats per minute, higher than the second-place moment by 8 beats per minute. The opening scene of the first episode, where Arya Stark impersonates Walder Frey, including the "Tell them Winter came for House Frey" statement, caused the highest average pulse rate of all scenes that didn't include any major action: 83.2 beats per minute. The third and fourth spots are tied at a slightly lower 83 beats per minute, with episode three's plea to Daenerys by Davos Seaworth and John Snow matching the first episode's proposal by Euron Greyjoy to marry Cersei Lannister. Lastly, fifth place went to Daenerys's questioning spymaster Varys's loyalty in episode two, scoring an average of 76 beats per minute. 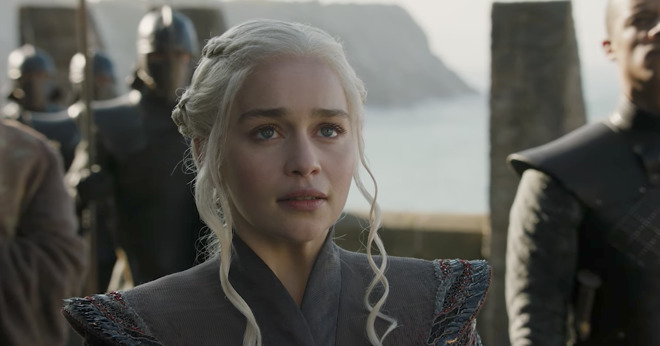 The findings, where dramatic dialogue-driven scenes dominate compared to high budget and violent action scenes, seems to correlate with "A Song of Ice and Fire" author George RR Martin's own beliefs in the matter. Martin often refers to a quote from William Faulkner in that the "only thing worth writing about is the human heart in conflict with itself," a phrase used as a guiding principle in his writing. Co-founded by Brandon Ballinger and Johnson Hsieh, Cardiogram aims to provide more details about a user's heart as they go through their day, with the app monitoring the heart rate every five minutes for norma, activities, with a more detailed view provided for workouts. The app can also be used to collect health data that can then be provided to medical researchers. In May, research by Cardiogram and the University of California, San Francisco, revealed it was possible to detect atrial fibrillation, a common heart arrhythmia that could cause a stroke, with a 97 percent accuracy using the Apple Watch's heart rate sensor. The study involved the development of an artificial intelligence-based algorithm by Cardiogram called DeepHeart, software that could become more accurate in detecting atrial fibrillation over time.